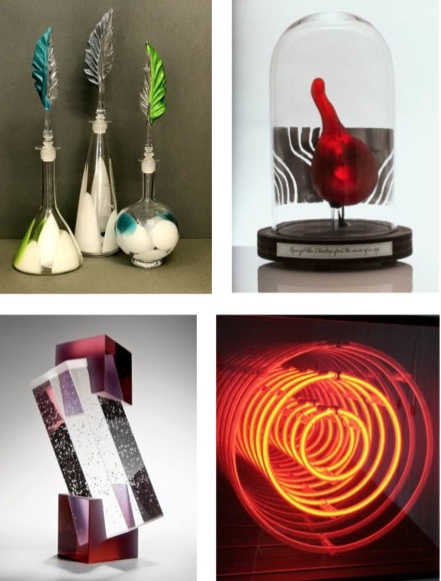 THE highly successful annual glass exhibition is now in its thirteenth year and this time will be focussed on the interaction between glass and science. It will show how scientific principles, either physical or chemical, can be exploited in the making process – or how science can directly influence the production, or be the subject of the artwork. Inspired by medical science a series of pieces show the reimagining of what an organic cell is, and how the act of making something that seems familiar show just how alien it may actually appear. Four linked pieces by another artist represent the morphologies of red blood cells, responding to a number of hereditary diseases that affect their shape. New techniques for integrating the graphic impact of medical scans with the material and optical qualities of glass were developed when an artist became fascinated by how making, particularly in glass, can crystallise and communicate powerful ideas. The science laboratory has inspired one of the regular exhibitors at Glasshaus to apply fanciful glass decoration to syringes. Another artist exhibits his version of retorts. The work of two other artists relates the extreme forces of black holes in the universe. Another has made a wall piece based on the radar system used to ensure the safe running of the aeroplanes around the world. Many of the exhibitors have been involved in the science of glass making to create their art. For instance the reactions that occur when metals such as copper and steel are exposed to increased temperatures and molten soda glass. The exposure to such high temperatures changes both metals from the familiar to the unrecognisable. A technique called Boiling Glass incorporates air pockets in the glass construction and when the fusing temperature is increased, a physical reaction takes place within the glass where the air rises to the surface, dragging the colours of the piece with it. “Moonrocks” which appear to glow from within are another example of employing science to create a special effect. Casting glass is all about science in action. The many materials and stages of the process involved in creating a cast glass object are a seamless fusion of art and science. The action of heat, gravity, viscosity, the chemistry of colour and how it reacts with light are all intrinsic to creating an artwork in cast glass. There are impressive pieces by several artists in the exhibition. The research for a PhD by one artist was the application of digital design and 3D printing for glass casting, for another’s PhD thesis at the Royal College the study of colour in glass included how this could change dramatically when lit by different light sources. One of the exhibitors is not primarily a glass artist. She is a practising neuro scientist with a keen interest in glass making and is building up her skills. Science is a vast subject, but glass making can encompass a large array of techniques and results too, also showing imagination and innovation. Many can be seen in this exhibition which is interesting as well as enjoyable.